Most of the time when theres low fog at the Golden Gate Bridge I find myself there during sunRISE. OK, perhaps not most of the time … Ive actually never been at the Golden Gate Bridge for low fog at sunSET. On this particular evening, however, my plans to photograph the SF coast were thwarted by fog and I quickly made my way over to the Bridge. Although the fog had ruined my chances of shooting the coast, it hadnt quite made its way over to the Golden Gate Bridge. In yet another detour from my plans, I made my way over towards the Pacific Coast side of Hawk Hill and looked out over a giant blanket of fog. Off in the distance the fog was beginning to envelop this hill and I loved the way the fog obscured the hills and created a giant blanket behind the trees. The line section of road helps draw the eye into the photograph. I chose to keep this photo dark so that it would stick with the mood of the scene. 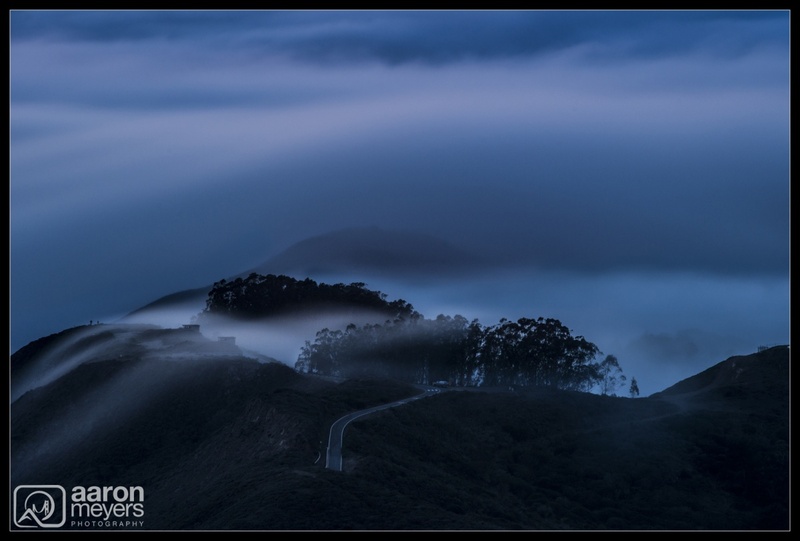 Additionally, since the sun had set and blue hour was now starting to set in, the fog took a slightly blue tone.